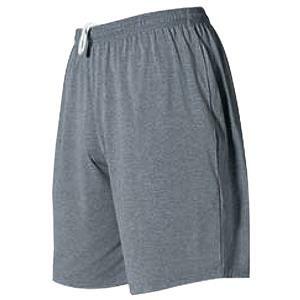 Alleson 505PY Youth Workout Athletic Short. This short is made of 62% polyester/33% cotton/5% spandex with a moisture management finish. It is a single ply, oversized cut short with a covered elastic waistband and inside drawcord. This short is made of 62% polyester/33% cotton/5% spandex with a moisture management finish. It is a single ply, oversized cut short with a covered elastic waistband and inside drawcord. WAIST 19" - 20" 24" - 26" 28" - 30"
Great fit -- true to size chart. Love the colors and great quality. The shorts came in faster than expected. Shorts are a little on the smaller side. If your child wears a small better get a medium. As my printer was putting decal on the leg noticed that several pairs had holes in the seam of the leg. I had to have 7 pairs fixed because they were closeouts and couldn't return them that's the reason for the 3 stars.